Wedding trends have confirmed that guests care a lot about the food they eat. If the food is not good, you should expect to hear your guests grumble. But if the quality of the food is impeccable, they will undoubtedly remember. Preparing food for a wedding is not just about feeding your guests; it is about hosting them. Weddings, like any other event, are all about hospitality. And sharing good food and eating together is what hospitality is about. Do not overlook the importance of serving good food at a wedding; most events are built around the quality of food served. Besides the meals, here are some benefits of catering services at a wedding. Trucks, glasses, plates, table cloths, kitchen furniture, cookware, thermal boxes, crates of dishes, carts, umbrellas, and other catering essentials are a fundamental part of the event. Thus, it is vital to ensure that the whole process is managed and coordinated in a manner which matches the overall theme of the wedding. The commitment and experience needed to ensure everything runs smoothly are immense, and this depicts the essence of having catering services. Any professional caterer cannot afford to compromise on the quality of their food. Otherwise, they might soon be out of business. A good caterer goes out of their way to ensure the raw materials, or ingredients used, are of the highest quality. This way, guests are served with excellent and digestible food which they will always enjoy. Besides offering your guests good food, it is imperative to ensure that it is served impeccably. 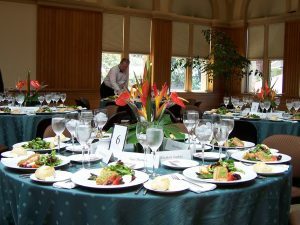 The catering team should be able to serve buffets, know how to handle service, and act professionally. The fact that professionals understand the ethos of hospitality, which is essential in any service job, means your guests will undoubtedly enjoy the service they get.